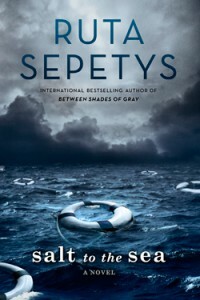 I have recently finished reading Salt to the Sea by Ruta Sepetys. This book was an extremely good one that i suggest to all middle school and high school readers. The concept of the book really hits you in the heart and will make you keep reading. While finishing the book I can see that the author has tied some real facts and accidents that have actually happened in history. One thing that was included was the sinking of the William Gustloff. This is a sinking that isn't very commonly known about but killed 9,400 Germans trying to escape the war life. The book is very vivid in the fact of mind, heart, and your look on the world. Sepetys writing is very unique and powerful. It entices the reader in every word. After reading my partners thoughts on her other book I can tell that this is something she does in every book and works hard to do it. Her writing captivates the reader by pulling at their heart strings and making them feel bad for the characters and what they are dealing with in the book. Since she is a historical fiction author, which is something common, you wouldn’t expect her to be able to make her writing so unique. She is able to use real life senerios and fictional senerios to combine them into a very realistic story. this really grabs the attention of the reader in many ways and i think it is something important and true to her writing. Advice that i have on how to find a book on booklikes.com is to search for authors you like and see if there are any books that pop up that you haven’t read by them yet, search for titles or subjects/genres you like, and find people who post on books you like to read. these tips could be very helpful for you and others searching for their next book of a victim. i suggest using these a lot and any other tips you have to find a good book.